This delicious and hearty meal is made in just one pot. Trim the lamb of fat and cut the meat into 3" large chunks. all over with salt and pepper. Over medium heat on the stovetop. Sear the lamb in two batches, turning over until well browned, about 5 to 7 minutes. Return all lamb to the pot and sprinkle the spices overtop, turning to coat evenly. Add the cinnamon sticks and stock to the pan and bring to a boil. 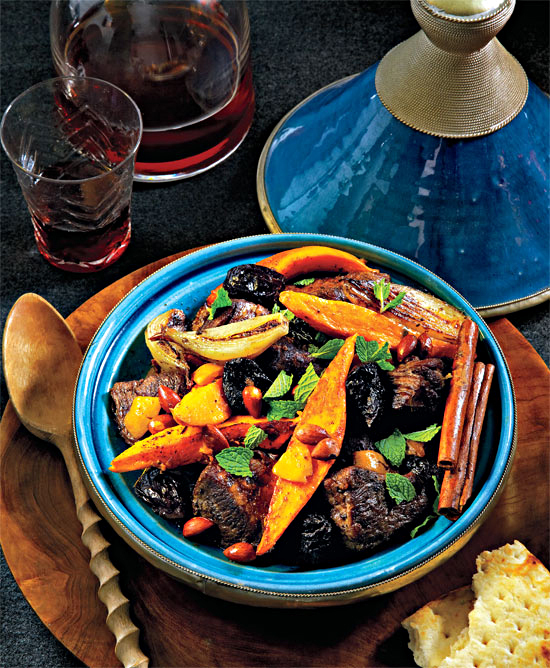 Cover the pan with the lid and bake in the oven for 1½ hours or until the lamb is very tender. Add the shallots, almonds, prunes and preserved lemons, stirring to combine. Place the sweet potatoes on top of the lamb. Put the lid back on the casserole and bake for another half hour. Remove lid and bake for half an hour more or until sweet potatoes are beginning to caramelize. Serve with fresh mint.